The ability to “zoom out” all my windows and display smaller versions of them so I can rapidly jump around. On the Mac, this is called Expose, and I access it by pressing F9. In GNOME, I have it mapped to Ctrl+Shift+Up (non-standard IIRC), and it’s provided by Compiz Fusion. This is a pointless feature if you only have a couple windows open, but when you’re really getting into something and you have a dozen or more things going on, this makes switching so much less painful. It’s especially good if you need to switch to an application that has “fallen to the bottom” of your window stack, or if you won’t recognize it by window title (because you have five terminals open and want the one with all the red prompts which you’ll recognize as the production database server). I’ve been a loyal FiOS customer for about a year and a half. I pay $69.99 a month for a 25/15 Mbps pipe. Aside from one absolutely miserable experience trying to speak to someone in billing who was able to update the expiration date on my credit card (it took four people, one of whom literally did not speak English, and about 45 minutes), I’ve been pretty happy. The connection is pretty reliable. But then they randomly raised my rate from $69.99/month to $79.99/month. No idea why, no explanation given. Worse, if you visit their site, $69.99 is the rate advertised, with no fine print about $79.99/month. They just randomly jacked up my rate to see if they could. 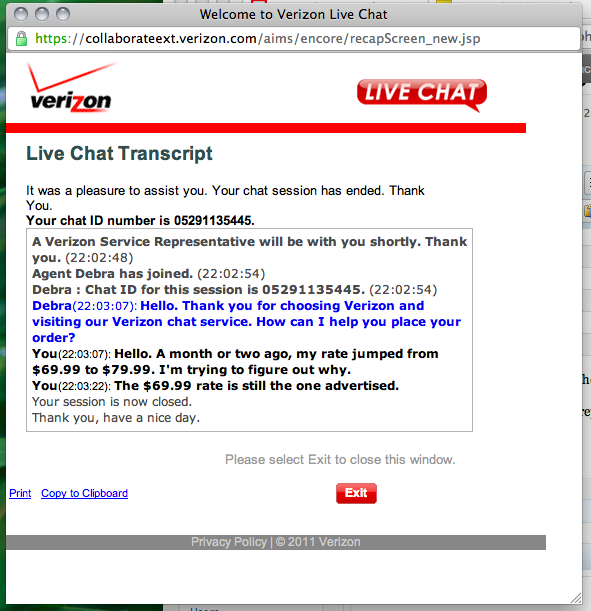 While scratching my head over this discrepancy and what could be going on, a Live Chat window popped up. Perfect, I thought! So now I’ve gone from being a little confused about why my rate went up to being incensed. They’re overcharging me, and when I asked them about it, they disconnected. More confusing still, when I went back and selected the 25/25 plan for $69.99, it implied that I was signing up for a one-year contract, when the drop-down on the page indicated I was viewing a month-to-month plan. 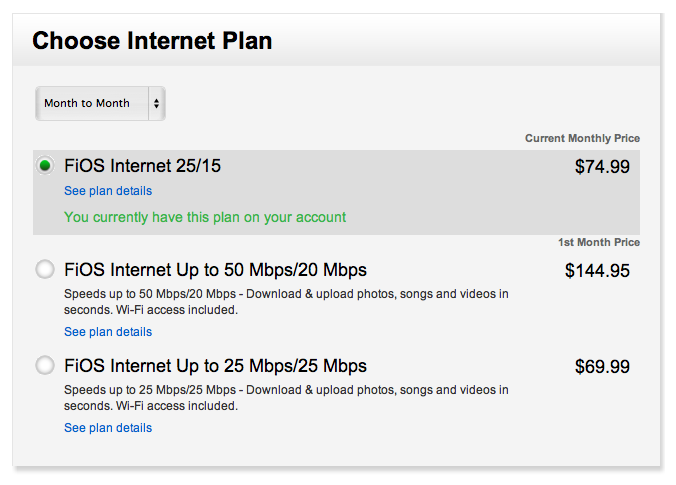 So I really like the fast 25 Mbps download speed, but I really can’t understand paying more than $70/month for Internet. RCN and Comcast both send me several offers in the mail, and can greatly undercut the prices Verizon is offering, albeit for slightly slower service. I think Verizon has just lost me as a customer. When your software “does the right thing” with intelligent defaults and a little cleverness to make my life easier, that’s awesome. Job well done! Smart software makes the world a better place. But there are some applications that let their smarts go to their head, and they become cocky. They force me to do things their way, to use the software its designers used it. If I want to do something different, I’m wrong. There are lots of examples of applications that get this right. They’ll warn you if you’re doing something stupid, and they try to structure their GUIs to make it hard to do stupid things. But, at the end of the day, if you’re really sure you want to do something it thinks is stupid, it will let you. Because, after all, us humans are the bosses. But here’s a perfect example of where it all goes wrong: setting up a mail account in a mail client. It prompts you for your name and email, and you click next, expecting to fill in the account details. Instead, it tries to find them for you. This is mildly irksome for me, as the mailserver I was connecting to has a non-obvious hostname, and my ISP blocks outgoing mail 25, so detection of incoming and outgoing mailservers both failed, and it took me about 30 seconds of waiting for this to happen. But it wasn’t that big of a deal. I plugged in the correct IMAP server hostname, and just left the SMTP server as-is, since I’m not actually going to send any email. Except, I can’t save. Every time I try, it goes off to validate the servers. It can’t reach the mailserver, so it tells me my information is wrong. There is no “Are you sure you want to save?” prompt. The SMTP server isn’t reachable, so I can’t add an account. I tried manual setup, which sounded promising. It bypassed trying to guess my credentials. But it turns out that it, too, insists on validating your accounts before it will save them. I can see why this happens. Some developer somewhere thought, “It makes no sense to add a mailserver account unless both the incoming and outgoing accounts work. I’m helping my users!” But in actuality, they’re just getting in my way. Now I have to install some sort of SMTP server on my laptop, just to fake out my mail client so it will have something functional to connect to and allow me to save my account. By all means, write smart software. Use defaults that work for the majority of people. Warn me if I do something that looks wrong. But don’t make your software refuse to do what the user instructs. How Osama and other operatives communicated. Did they use encryption? What sort? What type of computers did they use? What operating system? Were their computers infected with any sort of malware? Did they have the latest security patches applied? What non-terrorist-related things did they have installed? Games? Music? Video from the raid. It sounds like many bits of video were recorded, though I’m sure they’ll never see the light of day. But it would be most interesting to watch, even if the more graphic parts were omitted. How other people are reacting to the news. My sympathies are certainly with the families of those who died on 9/11, and those who were injured, but having a camera shoved in their face and asking them to tell us how they feel seems voyeuristic and disrespectful. Peoples’ opinions about whether the photos of bin Laden’s corpse should be released, whether they’re random people on the street, Presidential hopefuls, or “experts” of any sort. Their opinions don’t change anything. Whether or not waterboarding was tangentially related to the capture of bin Laden. The median salary for a Corrections Officer in the Boston area is $43,827. A Senior Corrections Officer — what I assume a career corrections officer would be when retiring at 55 for their “cushy” pension — is $50,938. This isn’t a bad salary per se, but if you’re in it for the money, this is probably not the job to have. The average life expectancy for a Correctional Officer is 59 years, sixteen years less than the average. I cannot easily find any credible sources, but a number of sources claim that there are more than 30,000 attacks on Corrections Officers each year, and that the average officer is “seriously” assaulted twice in their career. According to these statistics, then, in return for incurring two “serious” assaults and probably many more minor assaults, along with constant harassment, taunts, and stress, the average corrections officer will collect a $40,750/year pension for four years before their death. I’m not so sure that Correctional Officers have it so easy.